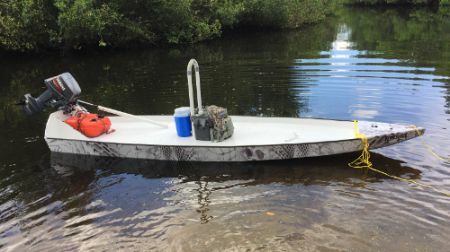 (Image Credit: Tony Nestor @ SkiffLife) Learn how to build a fishing boat with this one man flats boat fishing skiff: pole, paddle or outboard. 125 lbs, 2-1/2" draft. Easy to build like our kayak, canoes and other plans for small boats. Can be paddled, poled or fitted with a trolling motor or small outboard. This is a wider version of our FS13 Flats Skiff.